Lindsey Wettstein, 14, created the accessories after learning that the county Board of Elections would not be distributing stickers this year. When a South Hempstead teen learned there were no “I Voted” stickers at polling places in her neighborhood, she decided to do something about it. Lindsey Wettstein, 14, made about 800 stickers to give to voters in South Hempstead and Rockville Centre on Election Day Tuesday. Wettstein was disappointed when she learned from her mother that there wouldn’t be stickers at the polls for the midterm elections. Board of Elections officials said Monday that they wouldn’t be providing them due to budget constraints. 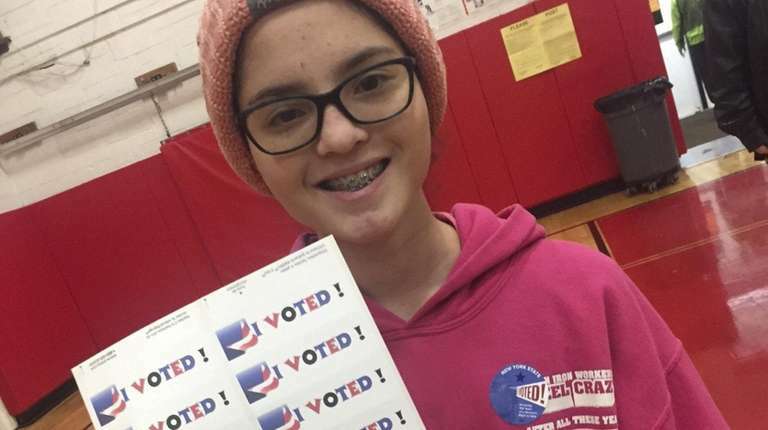 Before her mother, Michelle Wettstein, cast her ballot at the South Hempstead Fire Department, the teen made her own stickers by drawing on labels with red and blue marker, she said. She left them at the polling location Tuesday afternoon and then decided she wanted others to have stickers too. Wettstein said she spent the next couple hours creating more, wanting each to “look special.” She drew about 300 before her hand started cramping and her mother, using a computer, helped her design and print 500 more. Together they went around to eight polling places and left the stickers with staffers, who agreed to hand them out to voters, said Michelle Wettstein, 42. “It’s really nice to see her get involved, and I like that she was nonpartisan,” Michelle Wettstein said. Emma Travers, 50, said many voters at the Rockville Centre Recreation Center where she voted felt “slightly let down” not to get a sticker, but perked up when they saw the teen's unofficial version. “I think it’s really wonderful that she saw what was missing and she had the resolve to just go right ahead and do something about it,” said Travers, who proudly wore one of Wettstein’s stickers after casting her vote Tuesday.